The Pink Senorita: I'm So Exicted! I know that title makes you think of the Pointer Sister's song, haha. Well there is a reason why I'm so excited. 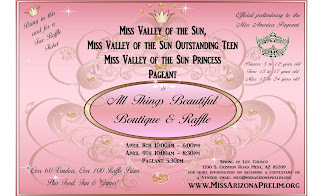 Last Wednesday I received a message on Etsy from the director the Miss Valley of the Sun Pageant here in Mesa, AZ. What!? They want me to set up a booth and sell my handmade items! So this is where I'll be April 8-9th. I will keep you posted of what happens at the event.